Tis the season. The season for political fakery. Canada has a new Prime Minister, Britain’s got a new face to its opposition party, and Trump... well, Trump’s got whatever Trump’s got. You may have seen the photos below circulating around the internet. But don’t believe a single pixel. They’re all lies. 1. Did the BBC really caption this “posh booing”? This screenshot of the BBC’s caption with “posh booing noises in background” has gone viral on both Facebook and Twitter. But it’s a total fake. The fakery was created by Twitter user TechnicallyRon. 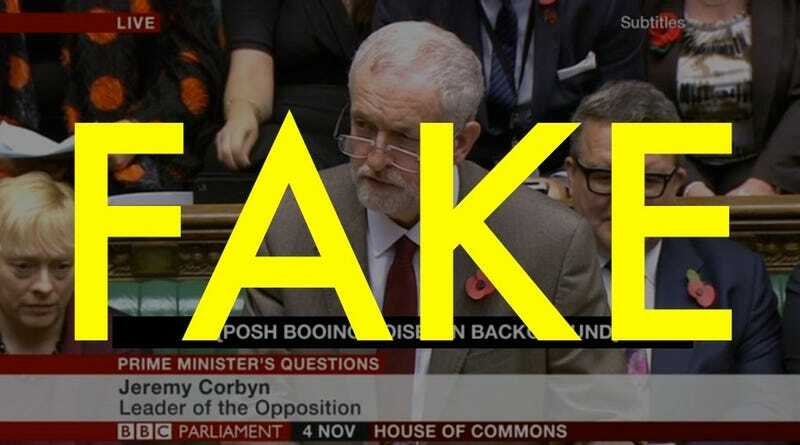 And despite the fact that major news outlets have re-published this screenshot of Jeremy Corbyn, it’s a complete photoshop fabrication. But I have to admit, as an American, anything in a British accent sounds pretty posh to me. 2. Is this a real ad for potato sauce? As James Lileks at the Minneapolis Star Tribune points out, the “vintage ad” on the left for something called potato sauce definitely looks real. But it’s a fake. It’s unclear who created it, but the ad always pops up on those “weird/gross food history” sites. A real ad for Nalley’s is on the right. Nalley is a food company, founded in 1918, that has produced all kinds of snacks and dips in its century-long history. But this ad for “potato sauce” was concocted in Photoshop. One big tip off? The font used on the bottle for “Norgold Russet” is called Life Savers, which didn’t exist at midcentury. Another clue that this one is a fake? Nalley’s tagline reads: Nalley’s is adequate! A ringing endorsement, indeed! 3. Is this the new Canadian Prime Minister Justin Trudeau as a baby? Canada just elected a new lefty Prime Minister after a decade of conservative government. And while there are plenty of embarrassing photos and video of Justin Trudeau, the pic above isn’t one of them. No, that’s not Fidel Castro holding Trudeau as a baby. It is, however, Justin’s late brother Michel. For those who don’t follow Canadian politics (I’m going to guess this means every American) Justin Trudeau is the son of former Canadian Prime Minister Pierre Trudeau who served in that position from 1968 until 1984. The family was taking an official diplomatic trip to Cuba in 1976, where baby Michel Trudeau is seen in the arms of Castro. The photo is real. It’s just not Justin. 4. Did Donald Trump really say in 1998 that Republicans were dumb? There’s no evidence that Trump ever said this, in People magazine (where it’s most often credited) or anywhere else. In fact, in 1999 Trump said he was a registered Republican. So you can tell your uncle who keeps posting this on Facebook to settle down. Trump’s Republican bona fides may still be in question, but this quote is a complete fake. 5. Is this Abraham Lincoln posing with Edgar Allan Poe? No, that isn’t Abe Lincoln posing for a photo with Edgar Allan Poe. As Yoni Appelbaum at the Atlantic points out, it’s from the book Abraham Lincoln: Vampire Hunter. The photo on the right, however, I can assure you is totally real. 6. Is this Lucille Ball on her wedding night in 1940? The photo above on the left is being passed around the internet as Lucille Ball on her wedding night in 1940. But it’s a publicity shot from her 1942 movie, The Big Street with co-star Henry Fonda, as you can see from the dress she’s wearing on the right. Ball wore wedding dresses on a number of occasions while acting, including the 1953 film The Long, Long Trailer. Imgur, you got some ‘splainin to do! 7. Is this Michele Bachmann saying something stupid about “illegal Mexicans in China”? As the political fact-checking website Politifact points out, this is totally fake. It’d be hilarious if she had said it. But much like the Trump quote above, she didn’t. Thanks to the internet, you can make anyone look like they’ve said just about anything. What a time to be alive. Correction: This post originally stated that Pierre Trudeau was PM of Canada from 1968 until 1979. In fact, he was briefly ousted in 1979 and became PM again in 1980 until 1984.